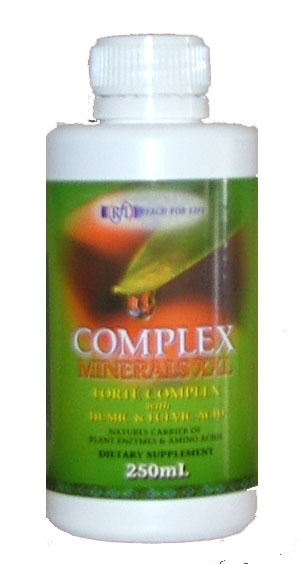 Complex Minerals XXL is an all-natural, completely organic dietary supplement, chelated from ancient plant matter rich in essential minerals, trace elements and amino acids. Complex Minerals XXL is a rich source of bio-available Fulvic Acid® (FA), Humic Acid® (HA), micro and macro mineral nutrients. The Fulvic and Humic Acids are organic compounds that act as organic mineral carriers and detoxifiers. Research results suggest that Humic and Fulvic Acid complexes enhance mineral and trace element uptake, supporting the maintenance of mineral and trace element balances without harmful buildup in the body's cells. Following dissociation of the minerals and trace elements delivered by the Humic/Fulvic Acid complex, the residual HA/FA complex can chelate heavy metals along the intestinal tract, in turn reducing heavy metal burdens in the digestive system. The only way the human body can benefit from mineral nutrients is if they are available to be absorbed. Fulvic Acid® enhances this absorption process by enabling minerals to pass through cell membranes. The average plant derived mineral is less then 0.00001 micron in size, conceivably the size of a red blood cell. The body is made up of 100 trillion cells that need constant mineral nutrients to support the energy level for healthy, vigorous life. Fulvic Acid® is the transporter to the body's cells and Humic Acid® is the carrier of minerals, trace elements and amino acids. Clinical Date is on File. Call for details.